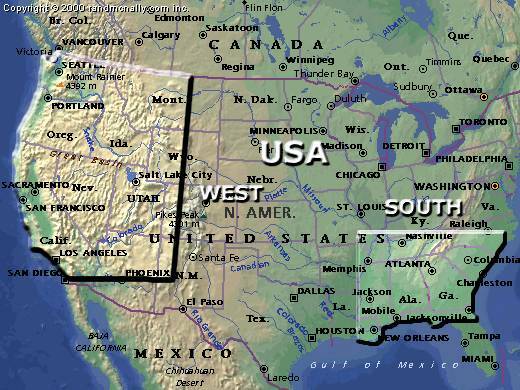 I visited two parts of the states, the western part in 1996 for 6 weeks together with two friends and the southern part in 1998/99 where I lived and studied in Atlanta for one year. The western part offers spectacular nature like huge canyons, majestic waterfalls, big mountains, hot springs and geysirs, rain forest, deserts...almost any kind of natural attractions one can think of. The south is of smaller scale, nevertheless providing fantastic nature as well like lush forests, rich vegetation, beautiful rivers and waterfalls, green mountains, deep gorges, nice beaches and even small canyons. The west is more spectacular concerning the nature but the south has more charme and flair with its breathtaking plantations and southern style villas.